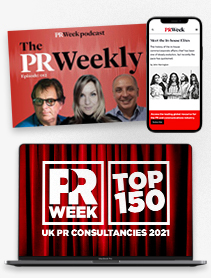 Your subscription includes unlimited global access to PRWeek.com, eligibility for all PRWeek email bulletins, and PRWeek magazine. If you work for an agency, you may already have a group corporate subscription in place. To check, or to enquire about new multi-user subscriptions, please contact Neil Johnston on +44 (0)20 8267 4232 or neil.johnston@haymarket.com. Please note that the prices listed above are exclusive of VAT, which will be added to your basket where applicable.